Silliman Journal (SJ) is an interdisciplinary peer refereed academic journal of Silliman University. First published in 1954 — with Founding Editor Pedro D. Dimaya, Founding Managing Editor Edith L. Tiempo, and Founding Board of Editors Dioscoro S. Rabor (Biological Sciences), J. Elliott Fisher (Social Sciences), Gerardo A. Imperial (Physical Sciences), and Edilberto K. Tiempo (Humanities) — SJ continues to commit to its mission of providing an avenue for scholarly dialogues not only among members of the Silliman academic community but also among its international readership. SJ aims to continue the dissemination of results of scholarly inquiry, to hold sacred the unique exchange between authors and readers, to endeavor to create opportunities for Silliman faculty and other scholars to engage in writing and publication and to strive to maintain excellence in academic research, scholarship and publication. The SILLIMAN JOURNAL is devoted to discussion and investigation in the humanities, social sciences, and sciences, and is published by Silliman University, Dumaguete City, Philippines. SJ publishes two issues per year, and has more than 200 journal exchanges with educational institutions, government bodies, and non-government organizations worldwide. It is indexed in the Modern Language Association (MLA) Bibliography; BIOSIS (now ZOOLOGICAL RECORDS), which publishes indexes and abstracts in Biology; ULRICH International Periodicals Directory, New Jersey, USA; the University Microfilms International, Michigan, USA; and the Index to Philippine Periodicals, among others. SJ is available in microfilm format at the University Microfilms International, Michigan, USA. The policies and practices of the SILLIMAN JOURNAL are based on formal actions of the SILLIMAN JOURNAL Editorial Board and on informal consensus and tradition. The SILLIMAN JOURNAL welcomes contributions in all fields from both Philippine and foreign scholars, but papers should preferably have some relevance to the Philippines, Asia, or the Pacific. Articles should be products of research, taken in its broadest sense; a scientific paper should make an original contribution to its field. Authors are advised to keep in mind that SILLIMAN JOURNAL has a general and international readership, and to structure their papers accordingly. The SILLIMAN JOURNAL also welcomes the submission of “Notes,” which generally are briefer and more tentative than full-length articles. Reports on work in progress, queries, updates, reports of impressions rather than research, responses to the works of others, even reminiscences are appropriate here. Book reviews and review articles will also be considered for publication. 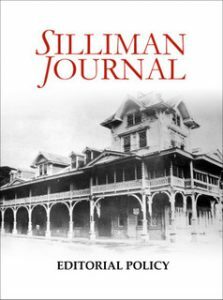 The SILLIMAN JOURNAL may also publish official documents of Silliman University. Jane Annette L. Belarmino, M.B.A.
Jose Edwin C. Cubelo, Ph.D.
Roy Olsen D. de Leon, M.S. Betsy Joy B. Tan, Ph.D.
Allan B. I. Bernardo, Ph.D.
Lester Edwin J. Ruiz, Ph.D. Please download our revised Editorial Policy and Guidelines. Other inquiries regarding editorial policies and contributions may be addressed to the Silliman Journal Business Manager or the Editor at the following email address: [email protected]. Silliman Journal welcomes submission of scholarly papers, research studies, brief reports in all fields from both Philippine and foreign scholars, but papers must have some relevance to the Philippines, Asia, or the Pacific. All submissions are refereed. Silliman Journal is especially receptive to the work of new authors. Articles should be products of research taken in its broadest sense and should make an original contribution to their respective fields. Authors are advised to keep in mind that Silliman Journal has a general and international readership, and to structure their papers accordingly. Silliman Journal does not accept papers which are currently under consideration by other journals or which have been previously published elsewhere. The submission of an article implies that, if accepted, the author agrees that the paper can be published exclusively by the journal concerned. Manuscripts of up to 20 pages, including tables and references, should conform to the conventions of format and style exemplified in a typical issue of Silliman Journal. Documentation of sources should be disciplined-based. Whenever possible, citations should appear in the body of the paper, holding footnotes to a minimum. Pictures or illustrations will be accepted only when absolutely necessary. All articles must be accompanied by an abstract and keywords and must use gender-fair language. Silliman Journal likewise welcomes submissions of ?Notes,? which generally are briefer and more tentative than full-length articles. Reports on work-in-progress, queries, updates, reports of impressions rather than research, responses to the works of others, even reminiscences are appropriate here. Silliman Journal also accepts for publication book reviews and review articles. The Editor will endeavor to acknowledge all submissions, consider them promptly, and notify the authors as soon as these have been refereed. Each author of a full-length article is entitled to one complimentary copy of the journal plus 20 off-print copies of her/his published paper. Additional copies are available by arrangement with the Editor or Business Manager before the issue goes to press. Other inquiries regarding editorial policies and contributions may be addressed to the Business Manager at [email protected], or the Editor at [email protected]. These are the recent issues of SILLIMAN JOURNAL available online as PDF. The SILLIMAN JOURNAL is currently endeavoring to put its entire archive online very soon.